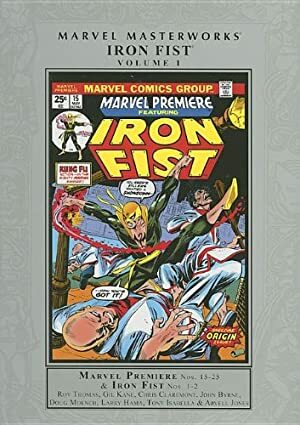 Professor Wing is a minor player in Iron Fist’s origin story. As such, he chiefly appeared in 1974/75. He is obscure, but he could easily be useful in a story as a consultant. 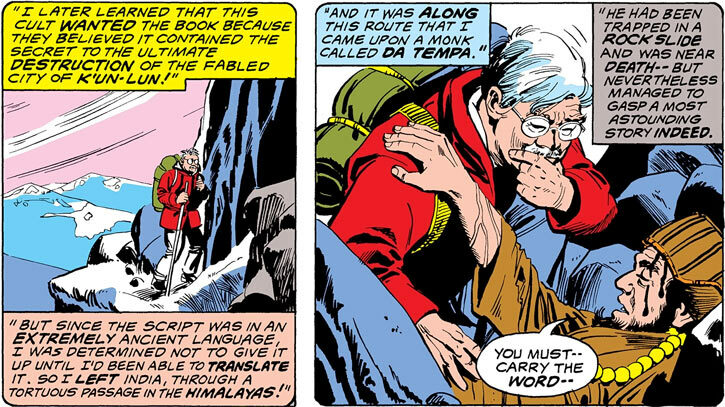 Prof. Wing is a pulp adventure fiction archetype. He’s the absent-minded professor with encyclopaedic knowledge, not-bad field skills and a beautiful and sassy daughter. This dated aspect might be why he hasn’t been seen much. Real Name: Professor Lee Wing. Known Relatives: Colleen (daughter), unnamed wife (deceased), Kenji Ozawa (father-in-law, deceased), Oji Ozawa (uncle-in-law). Base Of Operations: Columbia University ; New York City. Height: 5’8” Weight: 130 lbs. Professor Wing has extensive knowledge about numerous Asian civilisations. He’s chiefly an expert about their past, being an historian and archeologist. This knowledge extends to the downright arcane, such as the existence of K’un-Lun. Professor Wing is reputed for this. For instance, when a man was murdered using a dim-mak strike, Lee was the go-to expert for journalists investigating martial arts death blows. It seems that Wing was fairly physically adept during his youth and even quite far in middle age. At the very least he was a solid mountaineer and handgun shooter. Furthermore, there are clues about him having a martial arts background at some point. He’s no longer a physical fighter, though. Professor Wing was a professor of Oriental Studies at the University of Columbia. He was well-known in academic circles for extensive field research in remote corners of Asia. Wing ranged from the Himalayas to uncharted jungles. He married a Japanese woman of the Ozawa clan, who died after giving birth. The girl, Colleen, was raised in Japan as an Ozawa. It would seem that the Ozawa considered Wing to be kin despite his foreign origins. Colleen and Lee Wing were reunited when Colleen, in her early 20s, moved from Japan to New York City to live with him and care for him. Among the various finds professor Wing made during his career was the Book of Many Things, aka the Book of Kâli. He found it in Northern India when investigating a ruined temple of Kâli. Coming into possession of this volume earned him the relentless wrath of the Cult of Kara-Kai. As a result he left India, alone and on foot, through the Himalayas. While there, he happened on a dying monk trapped under a rock slide. The man had been in K’un-Lun during its last interfacing with the Earth, about a year prior. This had been the time when Heather and Daniel Rand reached K’un-Lun. Thus the monk had been told the story that ten years hence, during the next interfacing, Daniel Rand would be offered the choice. He could walk out of K’un-Lun to obtain vengeance against the murderer of his parents, renouncing the immortality that was his in the fantastic city. The monk also relayed a prophecy that Rand’s coming to Earth could possibly herald immortality for all. Guessing that Rand would choose vengeance over immortality and knowing the K’un-Lun interface cycle, Professor Wing sent his daughter to fetch Rand, now called Iron Fist. 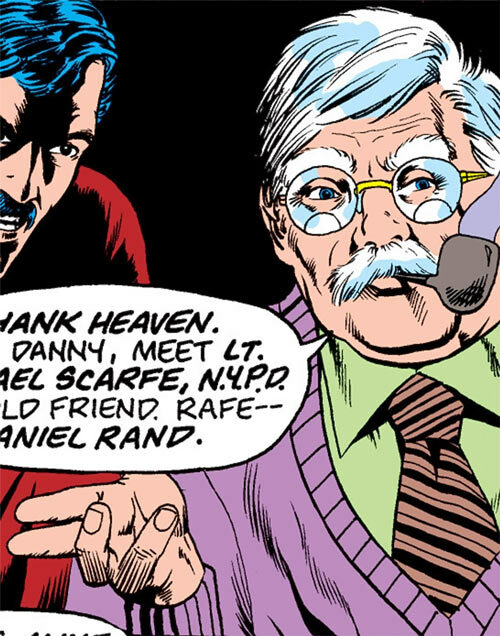 He then hired Iron Fist as a research assistant and bodyguard against the Cult. In this, he was apparently influenced by the Ninja. The Ninja was a mystical warrior bound in the Book of Many Things. He was able to influence and even possess Wing. The Ninja, secretly possessing Wing, had been helping Iron Fist in his vengeance. He wanted Iron Fist to help him watch over Wing. By keeping the professor alive, he gave Wing time to unlock the secrets of the Book, including how to free the Ninja. Eventually, the Book was destroyed, freeing Wing from both the occasional possessions by the Ninja and being stalked by the Cult. The powerful sorcerer Master Khan then set a complex plan in motion. It involved kidnapping Colleen Wing. Through illusions and intermediaries, he hired Angar the Screamer to do the deed. Angar subjected both Lee and Colleen wing to the full force of his scream, shattering the professor’s mind. When Iron Fist came in a short while later, Wing was already raving mad. He was convinced that the world was full of monsters who were all after his dear daughter. Brandishing a katana, he tried to kill Iron Fist, thinking him to be such a monster. Using his chi , Iron Fist sat by the professor’s bedside for days, infusing life energy into him until he was saved. But unlike Colleen, Professor Wing lacked the training to recover from the shock. Thus, his mind coped by blanking out everything having to do with the shock and subsequent delirium. He became an amnesiac. In particular, he didn’t remember having a daughter. This caused months of torment and nightmares for Colleen. Her father kept subconsciously refusing to admit she was her daughter in order not to bring back the memory of Angar’s mindstorm. She visited him in Florida, to little avail. However, a huge fight erupted just in front of Professor Wing’s bungalow. Seeing Iron Fist fight, he started remembering about him. Then, seeing Colleen subdue four attackers with a paddle brought back images of her training under Kenji Ozawa. He seemingly recovered his full memories at this point, recognising Colleen as his daughter. Professor Wing hasn’t been seen since AFAIK. It has been mentioned that Professor Wing was of mixed ethnic heritage. He does seem to have slight epicanthic folds. He only looks vaguely Asian, though, unlike his metis daughter. He probably is primarily Irish, since Colleen has to get her Irish blood from somewhere. Professor Wing has very little empathy. He concentrates solely on intellectual matters. He doesn’t seem to really care for anyone, even his daughter. On several occasions he nearly seems to use people. This odd detachment extends to situations of danger and crisis. He doesn’t seem to really care for those either. He was a bit smug about having survived so many attempts on his life, but never bothered telling his daughter. Maybe he was aware, on some level, that the Ninja was possessing and protecting him. Despite his lack of warmth, the Professor is simple and wise. He gives excellent and very matter-of-fact advice. He has a practical approach to most things, and doesn’t have his head up in the clouds like some academics do. His sense of priorities is a bit weird when it comes to knowledge in his field, though. To him, his attempts at deciphering the Book of Many Things were much more important than pesky things such as mad cultists trying to kill him. Even Colleen, often insisting that her father was a kind and wise person, had to admit that he was actually rather stubborn and uncaring. However, he cares deeply for her. If his “pretty daughter” is placed in serious danger, he will become uncharacteristically agitated and emotional. He even disapproved of her profession and occasionally heckled her about it, telling her she was too young for this. 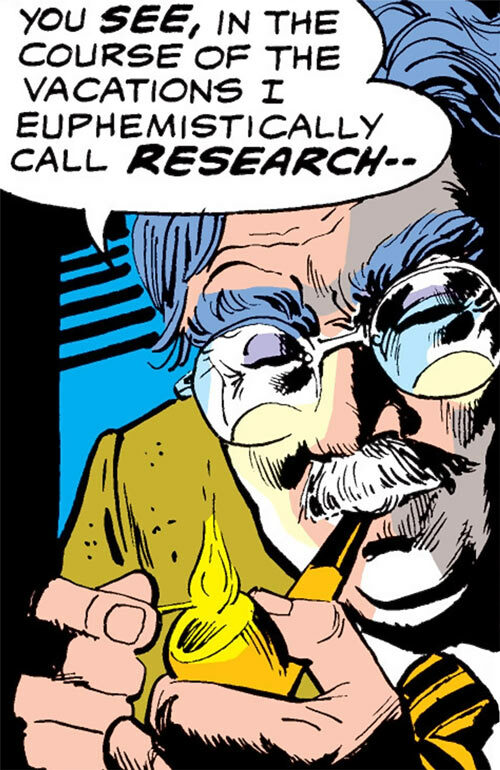 In the DCU the Book of Many Things would contain the secret of Ra’s al Ghul’s Lazarus pits. Thus Professor Wing would enlist Batman or Nightwing to protect him from the League of Assassins. This also allows you to introduce Colleen and Misty as part of the Batman supporting cast. Alternatively, you could have Ben Turner replace Iron Fist, and import 1970s Luke Cage to the 1970s DC universe to team up with him. Familiarity (Wilderness trekking and mountaineering), Iron Nerves, Languages (various Asian languages, including Japanese, Hindi, Nepalese and several Chineses), Scholar (Ancient Asian history, traditions and lore). Asian studies professors (Low), Detective Scarfe (Low), Ozawa clan (High), Iron Fist (High), Misty Knight (High). Age (old), MPR (near-sighted), Socially inept, MIA toward Knowledge. Defensive Attack, Defensive Roll 2. Benefit 1 (Affluent), Connected, Equipment 2, Second chance (Intimidation & fear), Languages 3 (various Asian languages, including Japanese, Hindi, Nepalese and several Chineses), Luck 1, Skill Mastery (Expertise (Ancient Asian history)), Well-Informed. Athletics 2 (+2), Deception 1 (+2), Expertise (Occult lore) 2 (+5), Expertise (Outdoorsman) 2 (+5), Expertise (Ancient Asian history, traditions and lore) 10 (+13), Insight 3 (+4), Perception 3 (+4), Ranged combat (Firearms) 1 (+2), Vehicles 2 (+3) (Limited 1 to land vehicles). Will often have a Light Pistol. Age Professor Wing is an old man, though he remains in decent health. He is also near-sighted. Cold fish Wing has little empathy or warmth, and prioritises the acquisition of knowledge over any interest in people. Rich past Professor Wing has been to many odd places and done odd things, and dangers from his past could rear up at any point. Trade-off areas. Attack/Effect PL 3, Dodge/Toughness PL 2, Parry/Toughness PL 2, Fort/Will PL 3. Points total 49. Abilities 14, Defences 8, Skills 13, Powers 0, Devices 0, Advantages 14. Equiv. PL 4. Source of Character: Old Iron Fist stuff. Helper(s): Jay Myers, Roy Cowan.